Finland is a land of forests, lakes, and reindeer, of high-tech telecommunications and information technology, of saunas and Santa Claus. Its northernmost zone is called the Land of the Midnight Sun, a region across the Arctic Circle where the sun doesn't set for around 73 days in summer; in winter, the sun vanishes for 51 days. Yet the south of Finland is highly industrialised and technologically advanced. Seventy-five percent of Finnish households have personal computers, and around 70% have a web connection. An amazing 98% of Finnish households use mobile phones. In various indices that measure quality of life around the world by taking into account such factors as GDP, health and health services, political stability, jobs, environmental quality, social well-being and even unchangeable things like geography and climate, Finland consistently comes out at or near the top. On The Economist's Quality of Life Index, Finland came out 12th in 2005. A 2007 Reader's Digest study ranked Finland 1st out of 141 countries. And on the United Nations 2006 Human Development Index, Finland ranked 11th on the list of most liveable countries. Finland's urban air quality is among the world's best. Education and health care are practically free. Of course, there are high taxes; but property taxes in Finland are fairly low. Finland is considered a wintery nation, and that it is: winter is the longest season, lasting some 105 to 120 days (longer in the northern regions), and it is very cold. But Finland does experience all four seasons, with an extreme temperature swing between winter and summer. In Southern Finland, which has a continental climate, autumn and spring are very short but extremely pleasant seasons. Summer is often quite warm, the temperature raised by heated air flowing in from the Baltic Sea and the Atlantic Ocean. The mildest weather is in the land Islands in the southwest. There it does get cold during winter, but less so than in the rest of the country. Finland has a population of 5.3 million. 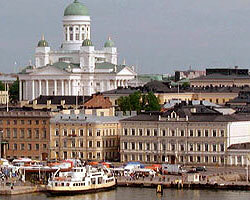 With a little more than half a million residents, the capital Helsinki is Finland's most populated area. The history of Finland is simply told. Swedish kings became established in Finland in 1249, and from then on, the aristocracy spoke Swedish, while Finnish was the language of the peasants. After two Russian invasions "known as the Greater Wrath (1714-1721) and the Lesser Wrath (1742-1743)" Finland became a Grand Duchy in the Russian Empire in 1809. Despite Russian occupation, national consciousness grew. In 1835 the Finnish national epic Kalevala was published, inspiring a strong nationalist movement. After a severe famine (1866-1868) killed 15% of the population, Russia relaxed controls, and economic development was rapid. The Russian revolution was followed in 1918 by Finland becoming an independent republic. Finland fought on the side of the Germans during World War II, but then changed sides and fought to keep the Germans out of northern Finland. In its post-war treaties with the Soviet Union, Finland was forced to cede 10% of its area. During the Cold War Finland was a free market economy, but developed good relations and trade privileges with the Soviet Union. Economic growth was very rapid. By 1975 Finland was the world's 15th richest country on a per capita basis. It developed an extensive welfare state, but like other countries has since liberalized its economy. In recent years Finland has developed into a telecommunications and information technology giant, one of the most advanced countries in the world in these sectors. Nokia, one of the world's largest mobile phone companies, is a Finnish company. Finland is a republic, with a president and a prime minister. It is divided into six administrative provinces.